So I blinked and all of a sudden my little sister went from a big blue eyed baby to a 15 year old heading to her prom! HOW?! When asked me to do her make-up for her, I was so touched that she thought I was good enough to do it for her, and that she trusted me to get it right. Although, to a 15 year old, prom is the biggest night of your life so far and everything, EVERYTHING has to be perfect. No pressure, then. 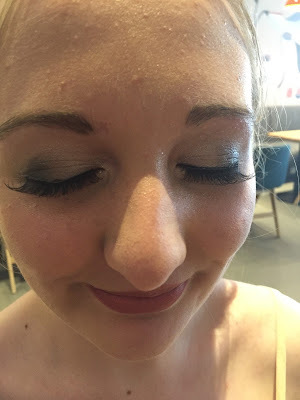 Although I was terrified of messing it up, and I had to do her make up on my break from work, in a badly lit Costa... I think I did a pretty bloody good job. So I thought I'd do a little post about the make-up look I gave her and the products that I used. I started with The Body Shop's Instaglow CC Cream in Bright Glow, which is my go-to primer for day and night. Because Isabelle has dry skin, I wanted to start off with something really hydrating, but Instaglow also gives such a beautiful, natural looking glow to the skin which looks amazing under make-up. I decided to use Isabelle's usual foundation, which is Bare Minerals Complexion Rescue. I thought about using something a little heavier, but decided that Isabelle's got such a pretty face in the first place that I didn't want to cake her in make-up and I really wanted to let her natural beauty shine through. Complexion Rescue gives a good amount of coverage, without sitting too heavy on the skin and giving a gorgeous, dewy finish. Being a teenager, Isabelle suffers a little bit with typical teenage skin, which obviously causes a little bit of insecurity. Luckily, I have a little pot of magic concealer in my make-up bag to banish any worries. Benefit's Erase Paste is one of my all-time favourite products, its industrial-strength formula is amazing at covering blemishes, dark circles, you name it. AND it isn't too yellow-y on pale skin! Yay! To finish, I used a little bit of Rimless Stay Matte Pressed Powder which I knew would keep Isabelle's make-up in place all night long, followed by Avon's Illuminating Face Pearls to give her a rosy glow. Base finished, moving on to eyes! I started by using Benefit's Goof Proof Eyebrow Pencil on Isabelle's brows. I like one-step, simple brow products and Goof Proof is perfect for quickly filling in and defining Isabelle's fair brows. I've recently discovered Urban Decay's Eyeshadow Primer Potion, which has now become one of my must-have products (post about it is coming soon!) so I used this for Isabelle's prom as I knew it'd be perfect to stop her eyeshadow from budging all night. I wanted to use an eyeshadow that complimented her dress, so I went for Avon Eye Dimensions Palette in Sultry Smoke, with a silver base which brought out the blue in Isabelle's eyes and picked up the silver details in her dress and accessories perfectly. Because the colour of her eyeshadow was fairly strong, I applied only a thin line of Benefit They're Real! Push Up Gel Liner just to frame the eyes. I picked up a set of Eyelure false lashes to lift Isabelle's natural lashes and really make her eyes stand out. She looked a little apprehensive when I pulled out the glue and came at her with it, but once they were on she loved them! Going fairly natural on the lips, I popped on a little bit of Bare Minerals Marvellous Moxie Lipliner in Thrilled, coupled with Benefit Hydra-Smooth Lip Colour in Wingwoman which was just a gorgeous colour on her! And voila, the finished product! I'm sure you'll all agree that she looks beautiful! I'm very proud of my little sister, and I'll definitely be re-creating this make-up look for my next special occasion!